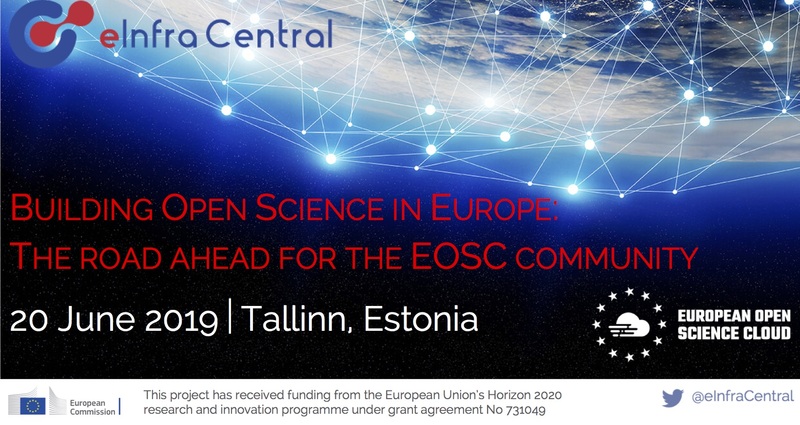 eInfraCentral invites researchers from public and private sectors, e-infrastructure service providers, research infrastructures and policy-makers to the EOSC community event on 20 June in Tallinn and Estonia. Funded by the European Union’s Horizon 2020 research and innovation programme, eInfraCentral is one of the key building blocks in the implementation of the EOSC Portal. Since January 2017, EFIS Centre, JNP, University of Athens, Leibniz University Hannover and five major European e-infrastructures EGI, EUDAT, GÉANT, OpenAIRE, and PRACE has worked together in developing a service catalogue for European e-infrastructures and e-services. The mission behind this work is to ensure that by 2020 a broader and more varied set of users (including industry) discovers and accesses the existing and developing e-infrastructure capacity. On 20 June 2019 we invite you all to take a forward-looking view and discuss the road ahead for the EOSC community in Europe and in the EU Member States. The programme was this event was developed by eInfraCentral in consultation with other EOSC-related projects such as EOSC-hub and EOSCsecretariat.eu. Tallinn as a location was chosen not by accident and not only because TNC19 will be happening there the same week. Estonia has an ambitious vision “of becoming a safe e-state with automatic e-services available 24/7” and Tallinn is one of the smartest cities in Europe. Achieving success in this digital transformation revolves around three keywords: accessibility, interoperability, and user-friendliness, all what the eInfraCentral team and the community strove to achieve in building the EOSC Catalogue! See you soon in Tallinn! Kohtumiseni Tallinnas! Biodiversity informatics and molecular taxonomy are two main research areas of Urmas Kõljalg, professor of mycology and a director of the Natural History Museum and Botanical Garden at the Univeristy of Tartu in Estonia. During the last eighteen years Professor Kõljalg has been developing online tools for the management of open and linked biodiversity data (http://plutof.com) and for the metabarcoding of fungi (https://unite.ut.ee). Currently, he is leading Estonian research infrastructure roadmap project NATARC (http://natarc.ut.ee/en/index.php) which is developing national e-infrastructure for the natural and earth sciences. H2020-funded eInfraCentral was set up to ensure that by 2020 a broader and more varied set of users (including industry) discovers and accesses the existing and developing e-infrastructure capacity. This is done through the creation of a common service catalogue in collaboration with Europe’s leading e-infrastructures, and the development of a portal through which to access it. eInfraCentral alongside EOSC-hub and OpenAIRE-Advance are the key building blocks of the future EOSC Portal. In this session, presenters will unpack the key achievements of the project and discuss how to further leverage the service catalogue, single sign-on, APIs and other outputs of eInfraCentral to support the future development of the EOSC. The EOSC Portal is set up to become a reference point for millions of European researchers looking for scientific applications, research data exploitation platforms, research data discovery platforms, data management and compute services, computing and storage resources as well as thematic and professional services. Having said that, during numerous stakeholder events in 2018, the topic of user-centric approach to portal creation was stressed on almost all occasions. This panel aspires to bring together end-users, user-focused research infrastructures, eInfrastructure service providers and research infrastructures, in order to discuss the key elements of a user-centric approach in building the EOSC Portal. This session will kick-off with an introductory statement by the EOSC Executive Board, highlighting the key objectives and expectations set by the Board in driving the EOSC and the EOSC Portal forward – especially capturing regional and national aspects. The topic will be further developed and debated by a panel of representatives from recent initiatives funded under the EOSC topic “Coordination of EOSC-relevant national initiatives across Europe and support to prospective EOSC service providers”. Although these initiatives have just started, their participants have been already active and linked to the EOSC landscape, bringing several novel ideas from their national perspectives. Focusing on the areas of relevance to EOSC – sustainability, landscape, FAIR, Rules of Participation, and Architecture – the panel will take a fresh perspective when addressing these topics. Discussions and conclusions from this panel may also serve as input to the work of the EOSC Executive Board. Enhancing the EOSC Portal and connecting thematic clouds is the next big step in enhancing and driving the value proposition of the EOSC for the Research Infrastructures and their users. This panel will bring together a number of eInfrastructure members of the eInfraCentral project (GEANT, EGI, EUDAT, OpenAIRE) research infrastructures of thematically-focused EOSC projects (EOSC-Life, PaNOSC, ESCAPE, ENVRI-FAIR, SSHOC). Topics to be debated include: (1) added-value of the EOSC Portal and its overall functions in the future, (2) skills perspective within EOSC capturing integration of e.g. various training materials, and (3) data and service discovery in the EOSC portal e.g. searching for data and services within a number of disciplinary catalogues, combining, automating and feeding in an optimal way services and data into the EOSC catalogue, etc.